We’ve got Latke and Kugel and Farfelle and Simcha,” says Amy Rose Dubin of the goats bumping up against her in the paddock. “They’re named by generation.” There’s a soup generation, a tree generation, and a generation of goats named after the family’s grandmothers. Dubin and her husband, Bruce Gleeman, bought eight acres of land here in Jefferson County about 13 years ago and started Chimacum Valley Dairy in 2014. Neither Gleeman nor Dubin were raised in farming families — Gleeman graduated from the Culinary institute of America, and Dubin did her undergrad at The Evergreen State College — but Dubin relates the work to their personal Jewish history. “We’ve gone back to our ancestral agricultural roots,” she says. The couple met 18 years ago on Sukkot at the Germantown Jewish Center in Philadelphia. 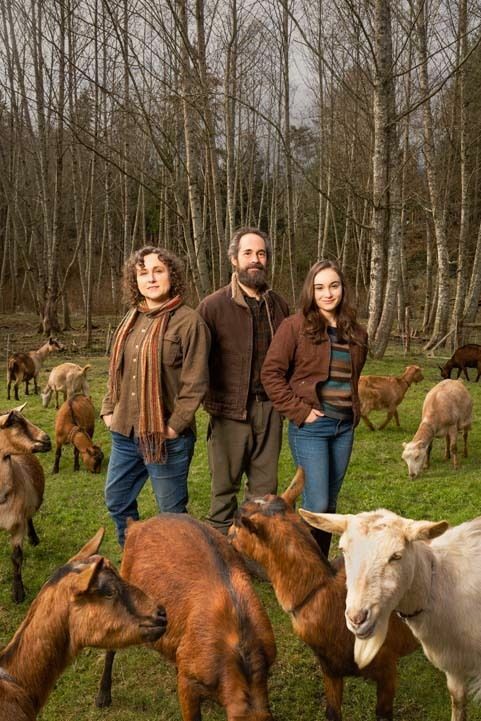 When their daughter, Esther, was 3, they traveled across the United States in an Airstream trailer with the intention of buying land to start a goat dairy in Thurston County, where Dubin had connections from college. When they didn’t find what they were looking for there, they headed out to the peninsula. “We had been to Port Townsend years before on vacation and thought, ‘Let’s go back and check that out,’” Dubin says. A carport capped with a blue tarp was the only structure on the property they ended up buying. Now there’s a henhouse, a greenhouse, a sauna, a barn, a dairy, a workshop, and a light-filled home with big windows that look out over the meadow where their 28 mixed-breed dairy goats can graze in knee-high grass. The flock grows to include as many as 40 babies when kidding starts. Gleeman, who revels in the solitude of cheesemaking, milks the herd from early spring through Sukkot, mirroring the historic Jewish agricultural season. 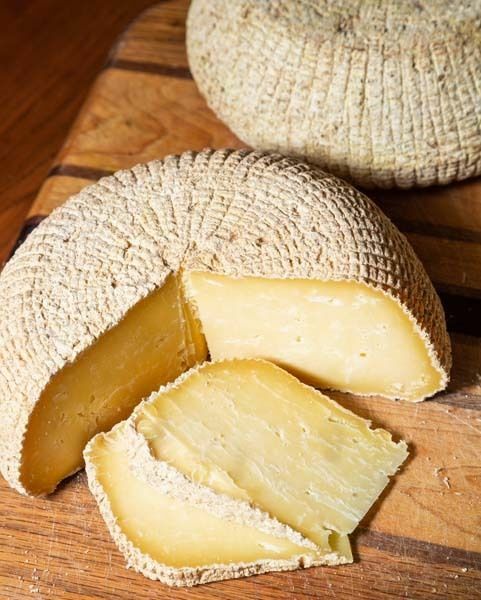 The fruit of their labor is a natural-rind, raw milk cheese that they make by hand. (When goat milk runs low, they also make a cow’s milk cheese with local milk.) The only automation on the farm is a small milker. “People use that word ‘handcrafted’ all the time,” Dubin says. “We truly are.” They sell at farmers markets around Jefferson County and to highly respected restaurants, like The Willows on Lummi Island and The Herb Farm in Woodinville. Dubin also once made scented goat milk soap for Esther’s bat mitzvah, which they celebrated at Bet Shira in Port Townsend.